Today I ran a relay marathon; that is, my partner ran the first half and I ran the second half. That’s how you do a marathon when you really are in no shape to do a marathon. I’m not going to go into all the details (but I will go into the more interesting ones) because that’s not the point of this post. The point is [SPOIL ALERT] I got A MAJOR AWARD. I know what you’re thinking. I just wrote a couple of blogs about the “I’m not a real runner” quote (https://randeebergen.wordpress.com/2013/10/19/im-not-a-real-runner/ and https://randeebergen.wordpress.com/2013/10/28/real-runners-are-just-that/) and, now, here I am, just a few weeks later, getting A MAJOR AWARD. 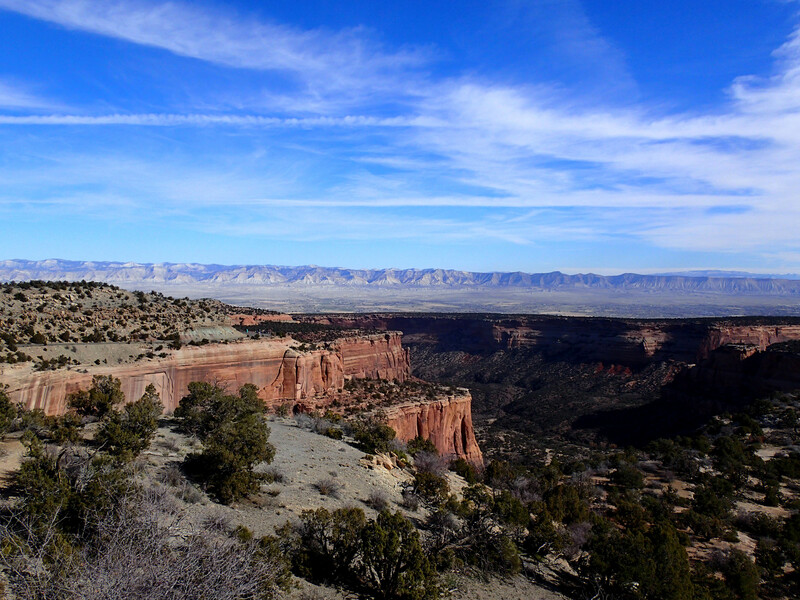 This event took place in my backyard, up and over the Colorado National Monument. 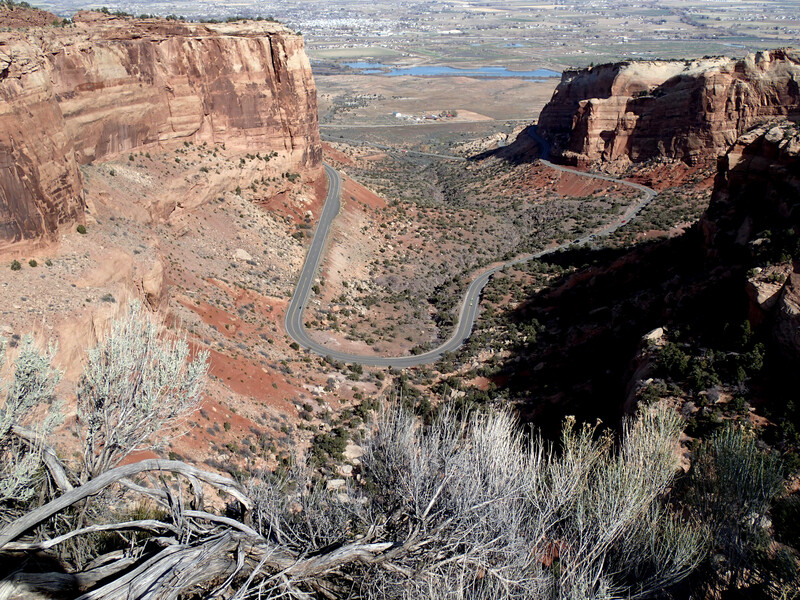 If you are ever passing through the western side of Colorado, you absolutely must take a short detour off I-70 to enjoy this scenic drive. 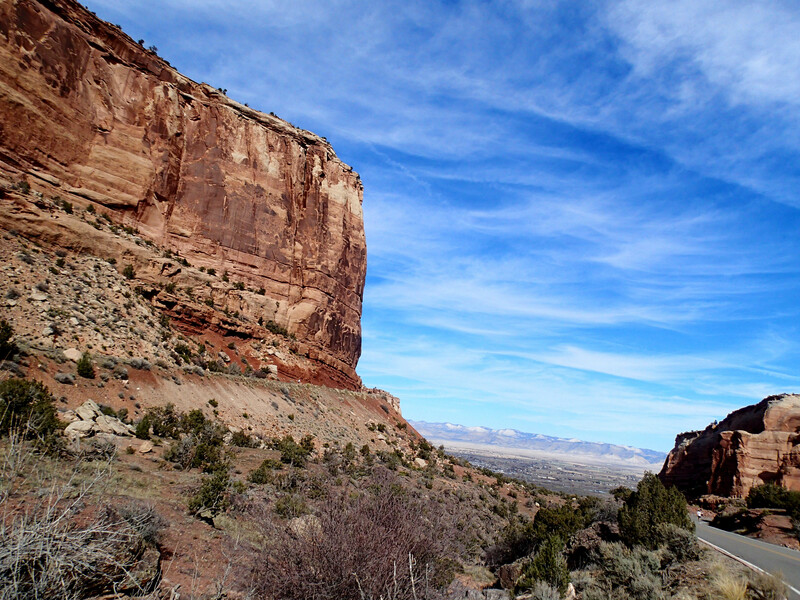 I have run across the Monument a few times, road biked across it, and, of course, driven it, many times, but still, I had to stop and take photos along the way today. 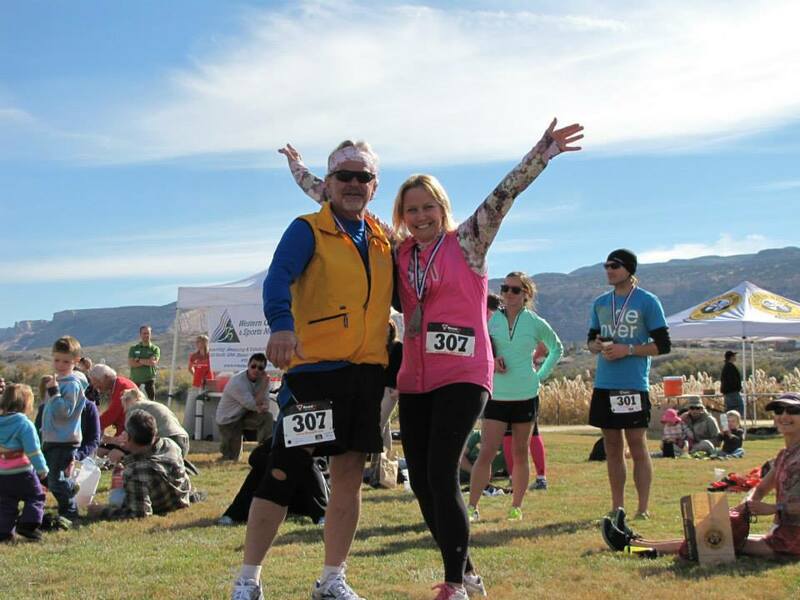 My relay partner, Butch, who recently turned 60, offered to do the first leg of the race. I’ve run this on my own twice, the whole marathon, so I know what the first leg entails–getting bussed to the start, standing around in the cold for an hour, and then, then, four miles of uphill switchbacks followed by another seven or eight of rolling hills. Luckily, the scenery is out of this world. 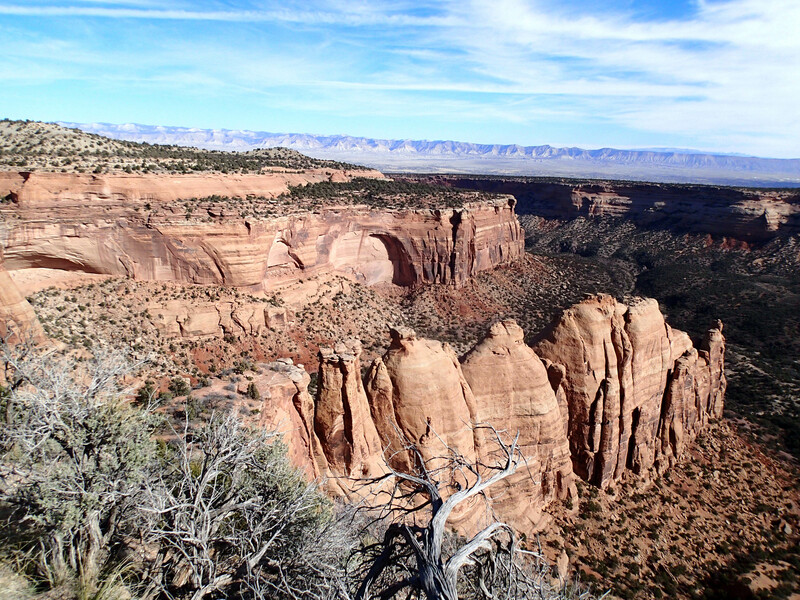 All of us second-leggers were bussed to the approximate middle of the top of the Colorado National Monument, where we hung out until our partners arrived, pooped and ready to hand over the baton. It was an unseasonably warm November day so we could be out of the bus and watching all the marathoners go by as well as be on the lookout for our relay partners. I waited about two hours before Butch showed up. During that time I drank a (second) Diet Coke, had a peanut butter and honey sandwich and a banana, and made a few trips to the bushes. I hung out with some of my running friends and got to know most of the others doing the downhill leg. And, I cheered for everyone going by. I also got amped up. I’d been awake since 5:00 a.m. and I didn’t start running until 10:25. My leg of the relay was downhill. Serious downhill. Painful downhill. After six miles of rolling road, I started in on the four miles of steep switchbacks into the valley below. 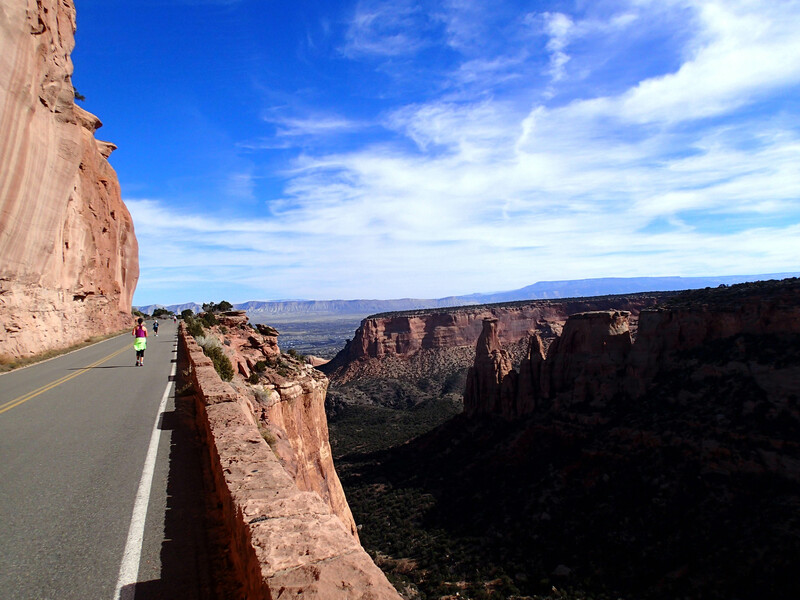 You’re supposed to train for this kind of running, pounding down steep pavement. I didn’t. I didn’t hurt too badly during it–just some localized knee pain that melted away when I hit the last three flat miles–but I’m sure I’ll feel it over the next few days. Now, you might think that, since I was fresh, I passed a few marathoners along the way, but no. Several marathoners passed me. They were running a faster pace on the full 26.2 miles than I was running on my 14 downhill miles. I know, surprise, surprise. 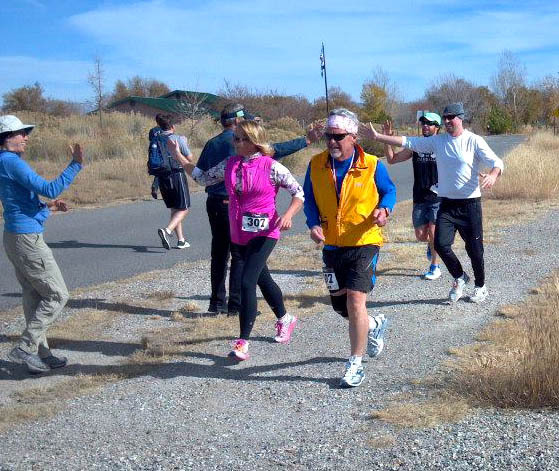 As I approached the finish, there was Butch, just as I was there as he completed his half. He ran in with me, which was a good thing, because I was barely moving along at that point. We went immediately to the food and beer because I was starving and had been for the last couple of miles. I got a turkey sandwich, chips, cookies, and hot soup and spread it all out on the table before me. Then I stared at it. For twenty minutes. It is impossible to eat immediately upon finishing a long run like that. Finally, Butch and I could eat. We chowed down and gained back some strength and visited with others, oblivious that the awards were happening a short ways away. “What?” Of course, I thought it was a joke. But he was grabbing my arm and nudging us along. It occurred to me, then, that we might be getting an award for the best team name–Butch Crotchety and the Slowpoke Kid. Confusion, shock, and elation all on my part. “I’ve never won an award before!” I shouted to the awards people, my partner, the crowd. 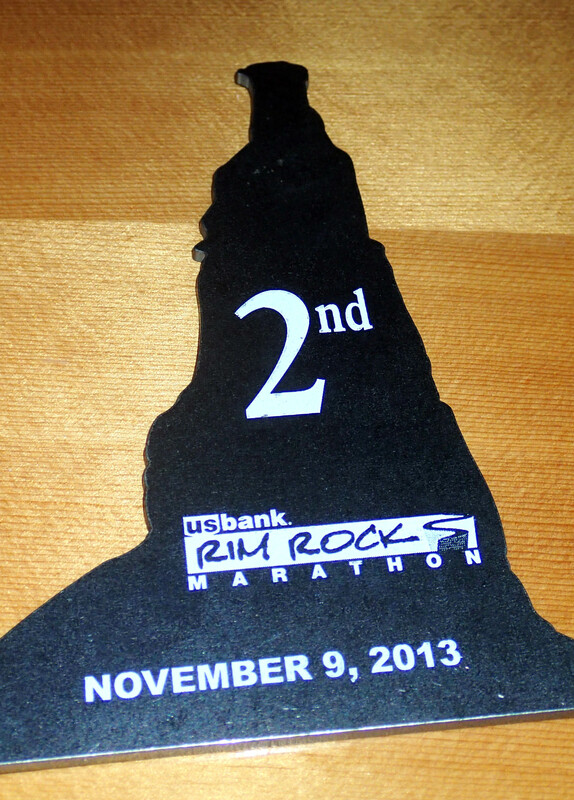 “Here, take it,” said Butch, handing me the rock monolith-shaped plaque. Anyone over the age of 40 is in “Masters” in running, but I’m not sure where that term came from or what exactly it means. You might think that the Masters group is full of old, slow people, but that is most definitely not the case. Some of the fastest runners are Masters and overall winners can easily be in the Masters age group. I always wonder if it means that, since you’re 40, surely you’ve mastered running by now. I, however, didn’t start running until I was 42. But here’s something I may have mastered–how I can get an award, or at least have a better shot at getting one. Enter an event with a relay. Get a partner. 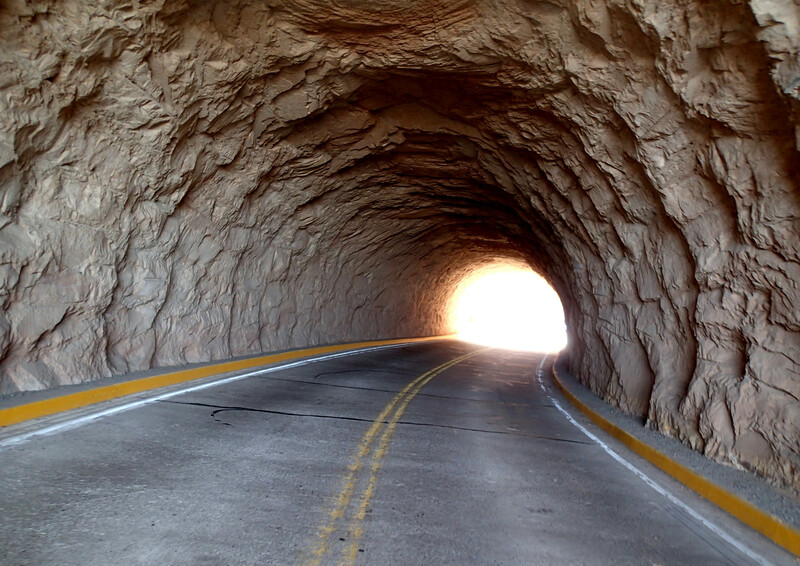 The partner doesn’t need to be Speedy Gonzalez; “it” just needs to be a “he” and he needs to be an old guy (you know, OVER 40). Then, make sure all of my fast women friends partner up with other women, so they won’t be messing up my chances in the co-ed division. 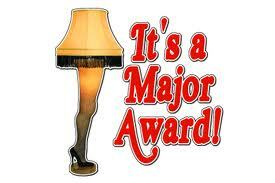 Really, I think it must be that we were both Masters and that we were a male/female team to have gotten A MAJOR AWARD. Or maybe, maybe, it’s because we were super fast relay marathoners who deserved it. [SPOIL ALERT] Not. Thank you, darling! Love you! I hope you could see some of the humor in that. It’s not about the award, as you know. Good luck with your running! Congrats! You have to be fast to get an award at a race. You ARE a real runner! Go Randee Go! And I love that Major Award. One of the best scenes in that movie! I know! It’s supposed to be humorous (the whole award thing), but many comments have been all CONGRATS and I’M GLAD YOU KNOW HOW TO GET AN AWARD NOW. Ugh! Exercise is a great habit. Keep it up and you’ll be like my mid-eighties Mom who can still lap me on a power walk! I plan to keep it up. Movement is what keeps us young. Thank you for your comment. Dude! I hate walking up hills! So Congrats! What an inspiration! I would love to do something like this one day! Go for it! Start now! It’s really quite fun and definitely a healthy habit.